Now in its 11th year, the Principles of Fundraising series of workshops continues to provide high-caliber, basic-skills development in the art and science of fundraising for nonprofits. 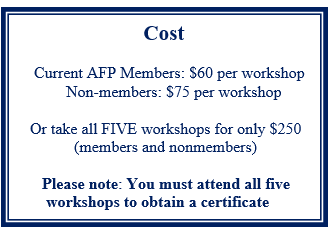 Created by the Association of Fundraising Professionals (AFP) Connecticut Chapter, the series provides five introductory-level, half-day workshops focusing on theory and practice taught by AFP members who are experts in their respective fields. Workshops are designed to help new and established nonprofit organizations raise money more effectively and efficiently. Please contact us at AFPCTChapter@gmail.com should you have any questions. This course is composed of five (5) modules that have been designed by experienced fundraising professionals to meet the needs and challenges nonprofit organizations face every day. This 15-hour extensive program will offer a complete overview of the development function, featuring the most current information and techniques. AFP Connecticut Chapter is offering The Principles of Fundraising Certificate Program to fundraising professionals with 0 to 5 years of experience, but may also be beneficial for Executive Directors, Board Members and Volunteers who may be transiting into the nonprofit sector and those new to the Development field to learn how to organize and manage a successful fundraising program. In the first session of this series, you will learn the essentials to create an integrated fund development plan. This workshop will provide methods for implementing a fundraising strategy from identifying potential funding streams to incorporating different types of activities to raise money to support your organization’s overall mission and strategic plan while meeting the needs of stakeholders. Those in attendance will learn to prioritize and establish basic policies and procedures needed to manage a solid fundraising program. Gina is the President of the AFP Connecticut Chapter and a seasoned fund development professional with over 25 years of experience developing strategies to generate revenue and grow philanthropic programs for nonprofit organizations. In her career, she has raised millions for various causes and most recently managed $8.0 million in endowments and other assets. Gina is also an AFP Master Trainer. Nonprofit organizations often seek grant support for their new or existing programs, capital campaigns, capacity-building efforts, equipment purchases, research, or special projects but fall short in receiving an award. Competition for grants from foundations and corporations continues to grow as government funding dwindles. Learn how to identify grant opportunities for your organization as well as prepare proposals that get the attention of grantmakers. This workshop provides not only tools and resources but also a proposal outline to prepare comprehensive, concise, and competitive grant applications. A successful annual giving program provides a steady flow of unrestricted financial support year after year to fund your nonprofit organization’s operations. This workshop will teach you how to build an annual giving program from generating a donor pipeline to keeping those donors coming back for a lifetime or longer. With a strong annual giving program, your organization will have the basis upon which to build all other fundraising activities. With additional government funding cuts anticipated, can your organization use help raising money from new funding sources? One of the best ways to do so is to call upon your board members, volunteers, and others to identify and introduce your organization to potential donors. Through numerous examples and a few exercises, you will learn where to look for the best volunteer fundraisers - many of whom are already in your midst – and how to work with and energize your volunteers. This workshop will also provide tools to evaluate volunteer effectiveness to increase your organization’s capacity to raise more money. In this last session of the series, you will take everything you have learned thus far to engage donors at a deeper level so that their annual giving reaches maximum financial capacity. Cultivating donors to provide major gifts to support specific programs or initiatives takes time but the payoff is worth it. This workshop will provide a framework for developing a successful individual major gifts program that includes laying the foundation of necessary attitudes, skills, insight, and knowledge to create meaningful donor relationships that can potentially lead to larger support for your organization. Abbie has been in the development field for over 40 years, as a consultant specializing in fund development and nonprofit governance for half of her career, and a senior development officer with four major institutions. She is a BoardSource Certified Governance Trainer, an expert on women’s philanthropy, and author of Women as Donors, Women as Philanthropists.